One of the often perplexing notions about markets is that there is some huge short-player who overpowers the market and forces it down. 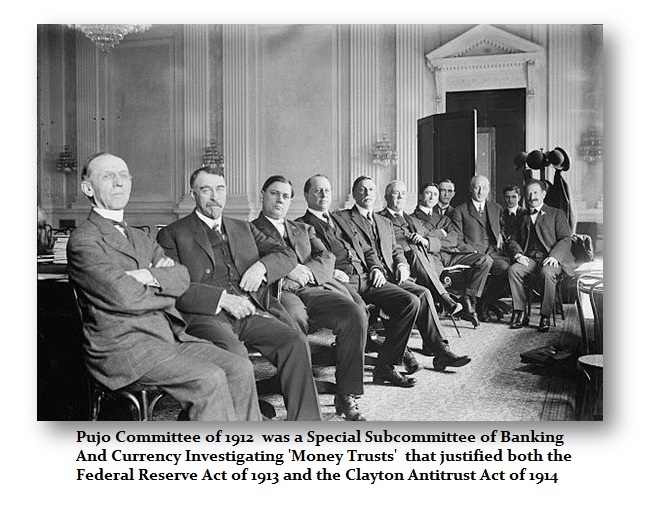 Every investigation since the notorious Pujo Hearingsduring the after math of the Panic of 1907 has begun looking for the mythical short player. Never has any investigation every found anyone. 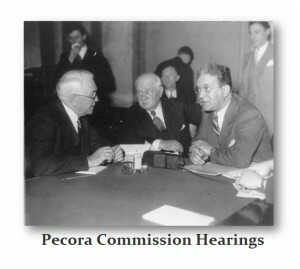 It was after a resolution introduced by congressman Charles Lindbergh Sr. to probe Wall Street assuming the crasg was abnormal and must have been caused by someone. Arsène Pujo (1861-1939) of Louisiana was given a congressional authorization to form a subcommittee of the House Committee on Banking and Currency. The lead prosecutor was Samuel Untermyer (1858-1940) who turned it into a ruthless mockery of justice and democracy. There was his famous interrogation of J.P. Morgan (1837-1913) that revealed how much this prosecutor did not know about finance. The economy is like a child. It grows, matures and evolves. Perhaps the greatest problem we face in attempting to reform our political-economy and move forward, has been the assumption that we are in control. We only to see things in our domestic political-economy and make our investments and policy decisions based upon this myopic domestic perspective. We assume governments are in control even though we do not understand what they are doing. They try desperately to influence what we think and do realizing that we actually respond to what we believe will happen in anticipation. Yet the economy is far more complex and sophisticated. Everything is actually connected precisely as it is in nature for we are part of nature and that same grand design. The global economy is much like a rain forest with billions of lifeforms all depending on another. 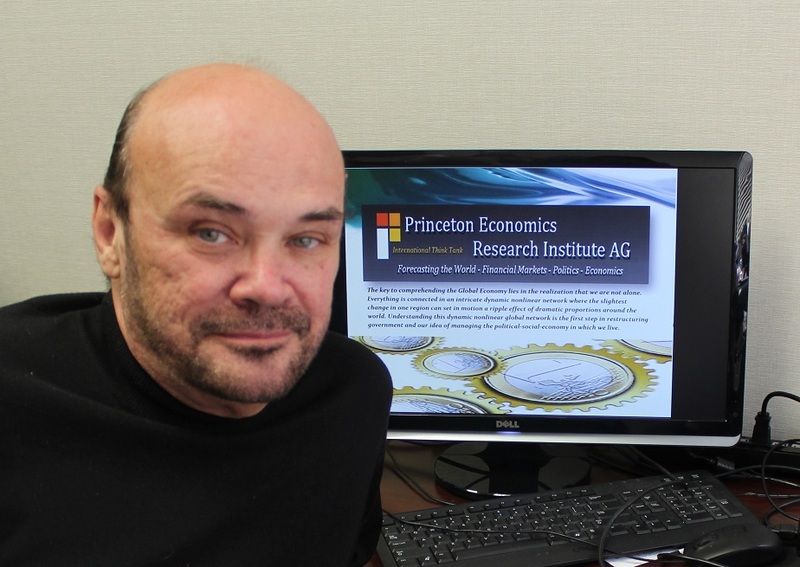 To analyze and model this kind of complex environmental and societal economic system requires research that views the system both as a whole and its component parts to reveal the interconnected data that lies hidden beneath the surface. This allows for the combination of small influences to cascade into larger global trends just as removing one specie in a rain forest will set off a chain reaction since it is either a predator or the prey in relation to other species. 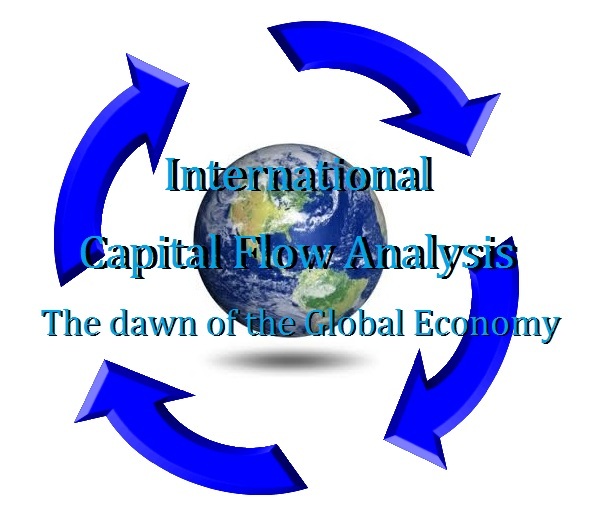 This is why we need to see the flow of capital between all the players for linking the global data for the analysis reveals the whole complex system, and not just a subset of all the interesting operations and processes of the system. We cannot reduce the trend to a single cause and effect. The global economy is akin to a rain forest with countless species interacting with one dependent upon another. Remove one, and you begin a chain reaction with unintended or knowable circumstances. We are incapable to constructing a rain forest because we do not understand all the subtle interconnections. Australian learned that lesson by importing one specie to accomplish one goal that introduced a predator altering the environmental balance. 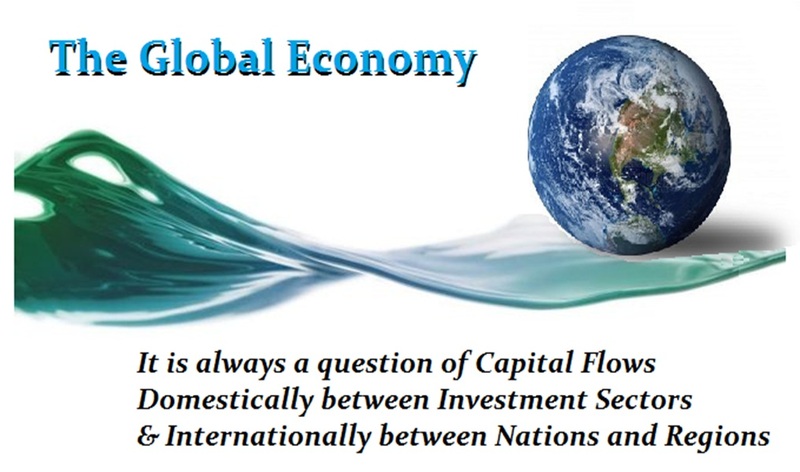 Likewise, altering taxes, trade regulations, and investment regulations alters capital flows that can be extremely destructive. 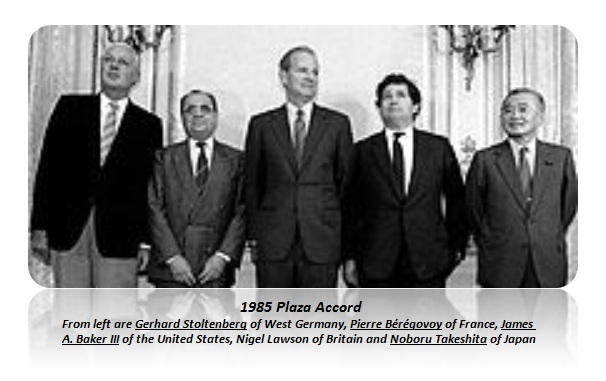 The Plaza accord starting the G5 (now G20) to manipulate the dollar down by 40% in order to reduce the US trade deficit, created the 1987 Crash and sent capital rushing back to Japan that they did not understand creating the 1989 Bubble. The capital flow chaos unleashed by the G5 was devastating. 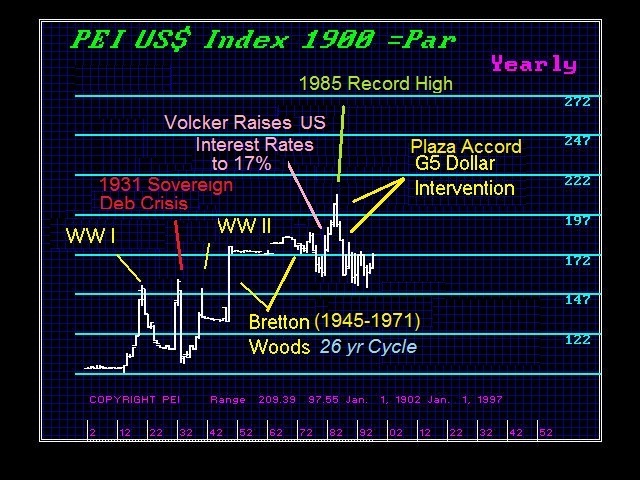 The G5 caused the capital withdraw from the USA and the 1987 Crash on a panic the dollar would decline by 40% and that set off a capital concentration back into Japan. 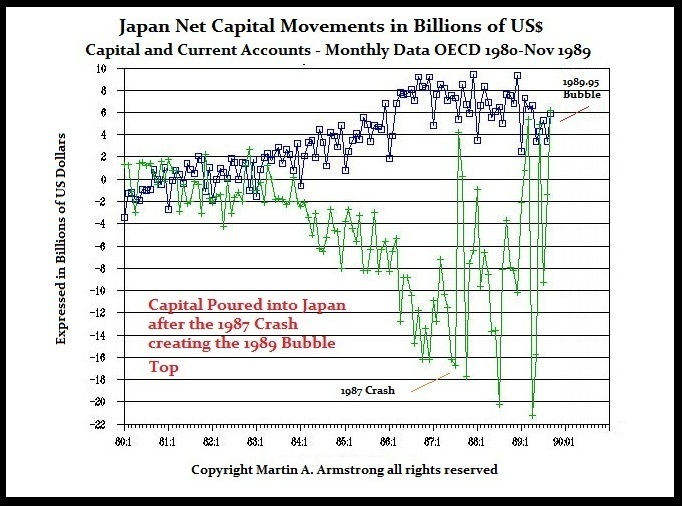 As the yen rose and the Nikkei, that attracted foreign investors creating the Bubble in 1989. Capital then fled Japan and moved into South East Asia. The capital then flows to South East Asia and created the peaks in 1994. That was the precise low in the S&P500 back in the USA. Capital then began to shift toward the US and European markets and this flow intensified because of the expect launch of the Euro in 1998. That led to the Currency Crisis of 1997. 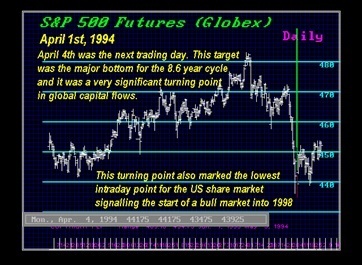 The turning point in 1994.25 marked the precise low in the US share market and the shift in capital flows out of South East Asia. Every single thing is connected on a global scale. We must come to understand that the economy has matured and evolved in ways we have ignored and remain oblivious to their development. In many ways, we still assume the world is flat economically. We fail to grasp the global economic evolution all around us because it confronts our politicians, economists, and the central bankers who prefer the limited domestic economy view in which they can be masters of the universe. The evolution of our global economy is challenging the very ideas and theories of economics that deprives them of the power they desire as interventionists. If the economy is malleable, then they can control it. If the economy is interlinked, then we are all in this together and we cannot control the economy with raising taxes to create “social justice” without endangering the entire system. This basic assumption of a domestic economy within the grasp of government is what I call the Fish Bowl Economy entirely self-contained. All economic theories are predicated upon this concept and justify government intervention to alter domestic trends that may be set in motion externally. This domestic myopic view that supports centralized panning and governmental power was the foundation of communism that crumbled to dust. Government, assuming variable degrees of power, has been unable to prevent any crash and always seeks greater power in the aftermath with each event claiming they will prevent the next. They cannot see the global economy for it is beyond their power. 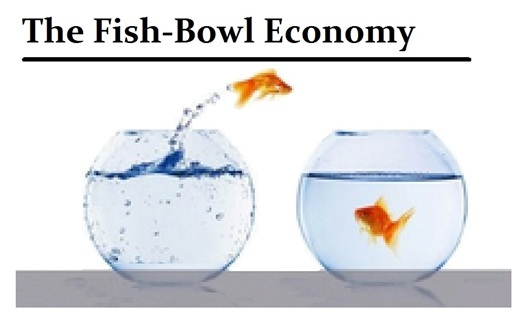 This view of a domestic Fish Bowl Economy, excludes the possibility that a fish can leap from one bowl to the next. Therein lies the flaw in economic theories that justify government control. There is an interesting concern rising from the too numerous exchanges for Bitcoin. A study has revealed that the market is being manipulated to create the impression that there is a $6 billion market trading every day. This manipulation is all about boosting the image of volume using what the study shows are known as “wash trades” where the same party is buying and selling at the very same price. The survey, first reported by The Wall Street Journal, echoes concerns by regulators that cryptocurrency markets are still ripe for manipulation. The San Francisco-based firm compared at Coinbase Pro, which reports about $27 million in average daily volume in bitcoin. It’s median “spread,” between the price a seller wants and the price a buyer wants, for bitcoin was about 1 cent. That scenario passed Bitwise’s test for having real volume. The SEC has highlighted this risk of manipulation as the very reason for rejecting any further applications for other cryptocurrencies ETFs. Clearly, this also explains why trading volume for regulated Bitcoin futures has seemed weak and a small fraction of these unregulated exchanges. 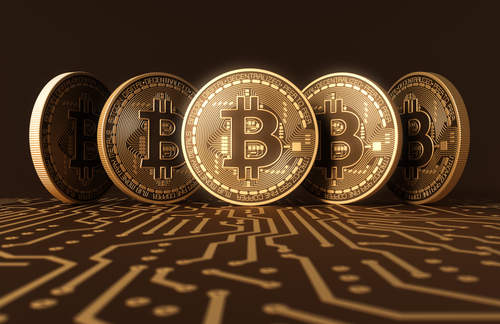 Chicago-based CME and Cboe began listing Bitcoin derivatives at the end of 2017 but have had significantly lower volumes than the $6 billion reported by unregulated exchanges. The largest single trade was $320 million. The open interest on the CME is only 3,671 contracts, which are composed of 5 Bitcoins per contract. 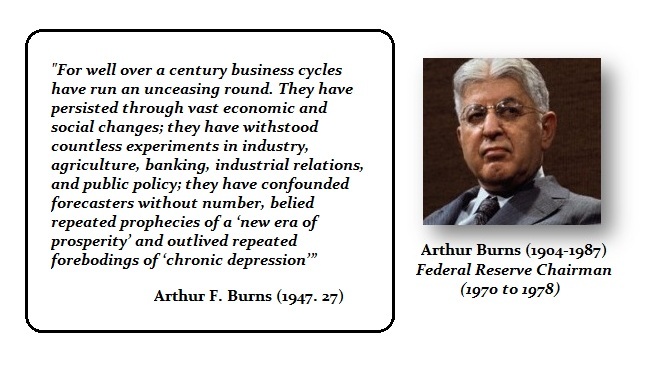 There are those that adamantly deny the existence of a Business Cycle for one simple reason; if a regular Business Cycle exists, then man and his government, driven by special interests, are incapable of manipulating its outcome. The entire foundation of Marxism was the recognition of the Business Cycle and the idea that it could be eliminated by confiscating all the wealth of the people. 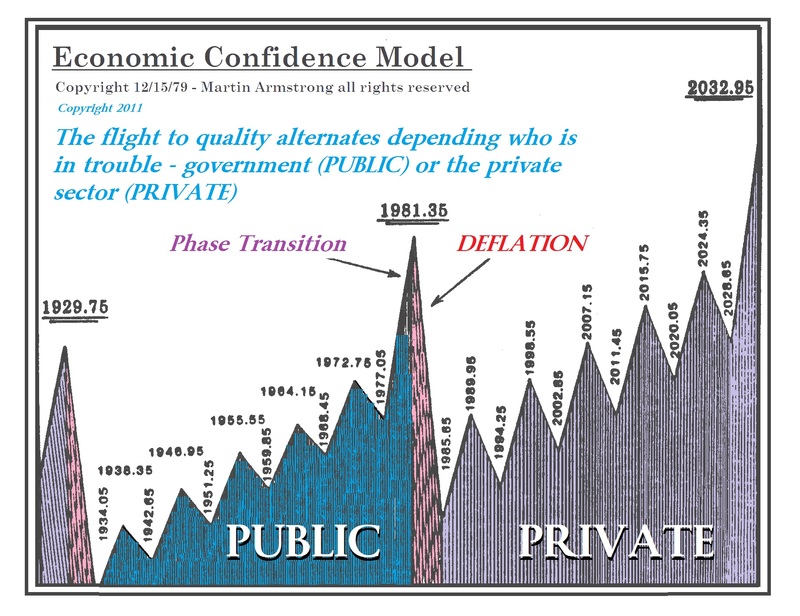 Even John Maynard Keynes(1883–1946) followed this basic tenet of Karl Marx (1818–1883) and assumed that government had a role it could play in preventing the Business Cycle from rising and falling. Yet in the midst of such adversity, what these ideas ignored is that man learns from his mistakes as an individual as well as a group. 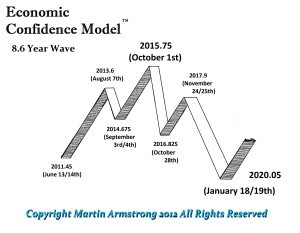 It has been through the Business Cycle that all advancement and thus economic evolution emerges. 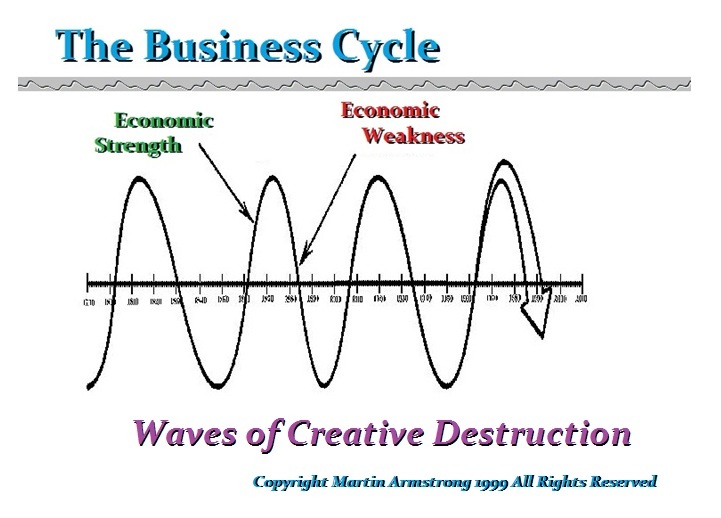 Joseph Schumpeter (1883–1950) called these Business Cycle events – Waves of Creative Destruction. Unless oil rises in price to excessively high price levels, alternative fuels will never be developed. There must be a viable economic foundation to open the door to whatever new alternative might exist. This becomes the economic evolution within society. 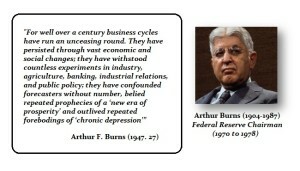 Even the previous Chairman of the Federal Reserve Arthur Burns (1904-1987) shared the same view. 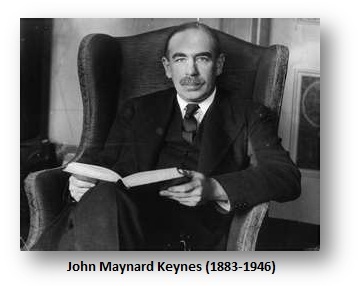 Government with all its power and endorsement of John Maynard Keynes (1883-1946) who argued that the economy can be managed to eliminate the Business Cycle, has been unable to prevent recessions and economic booms. 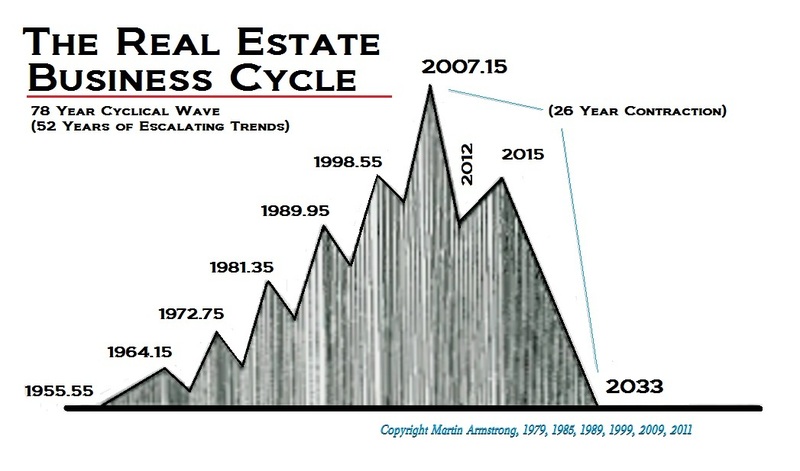 Indeed, the Business Cycle is as regular as the four seasons for even weather is incorporated within it. As weather has fluctuated according to a 300-year cycle in the energy output of the sun, mankind has been driven hither and yon in search of better weather and food supply. Thus, migration throughout the world has also been a byproduct of the Business Cycle. 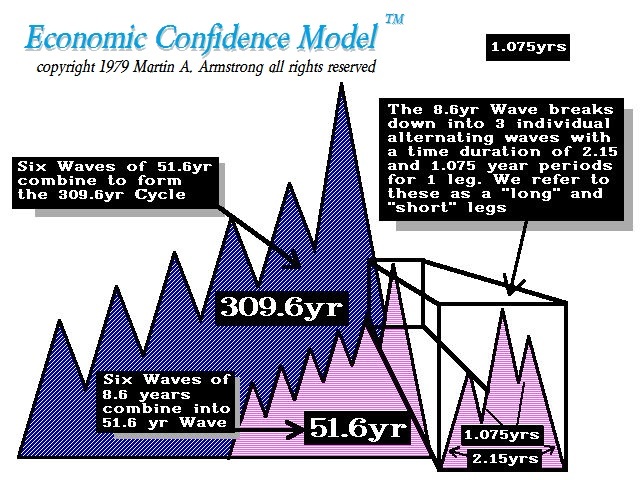 Even if we look at the economic composition of society since the late 1700s, we can see how nothing remains stagnant but is always captured within the fluctuations of the Business Cycle. To a large extent, society was still 70% agrarian in major countries during the mid-19th century. 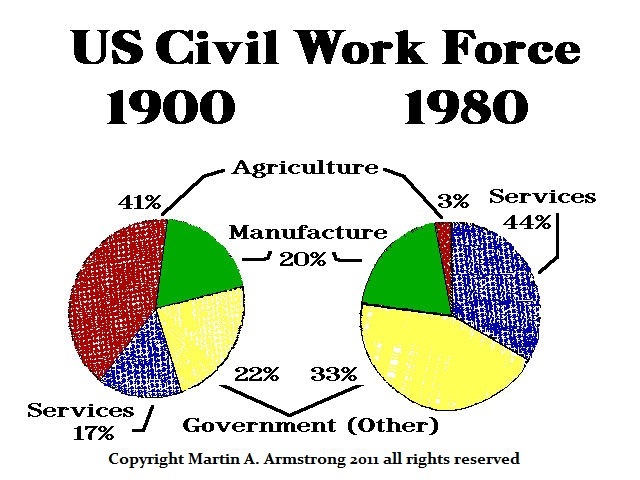 By 1900, still about 41% of the civil work force was employed in agriculture, which fell to 3% finally by 1980. 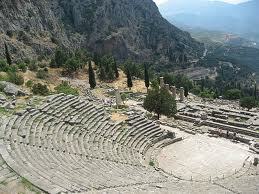 Consequently, one can neither manipulate the weather nor dictate to God what he prefers to see economically. Simply put, you cannot pass a law to prevent droughts or make it rain. During the 19th century, there were great waves of innovation that certainly helped to bring about recoveries within the U.S. economy. Nonetheless, while these stages of the Industrial Revolution were unfolding to propel the economy out of the depths of recession or depression, money supply was also unpredictable. 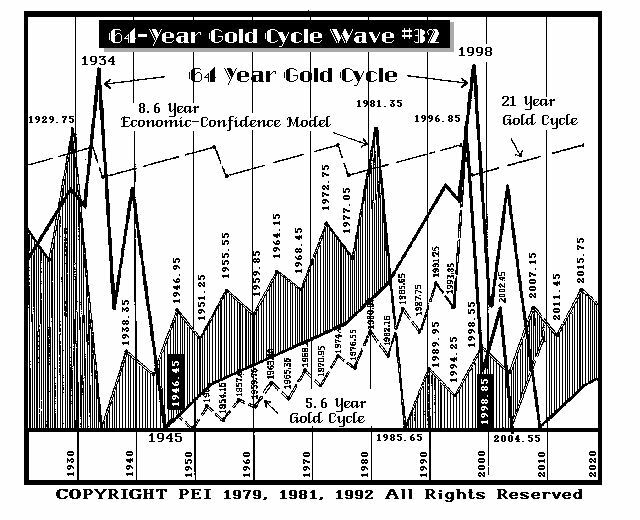 Because the monetary standard was gold at the time, this cause havoc with the economy for great waves of inflation were unleashed upon the population purely as a factor of new discovery. There was the 1849 Gold Rush is California. This was followed by the Australian Gold Rush where between 1851 and 1861, Australia produced one third of the world’s new gold supply. The silver discoveries in Colorado took place in 1864 and this eventually fueled the huge inflationary boom flooding the economy with silver dollars after 1878 that led to the Panic of 1893. Then in Alaska gold was discovered in large quantities in the Klondike on August 16, 1896. 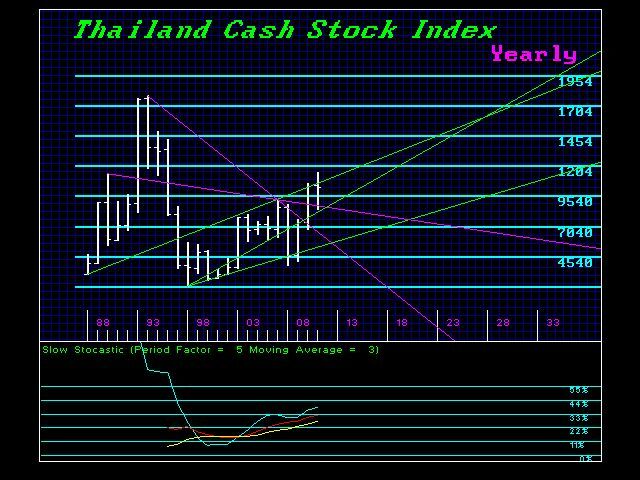 This created another great expansion of money supply. 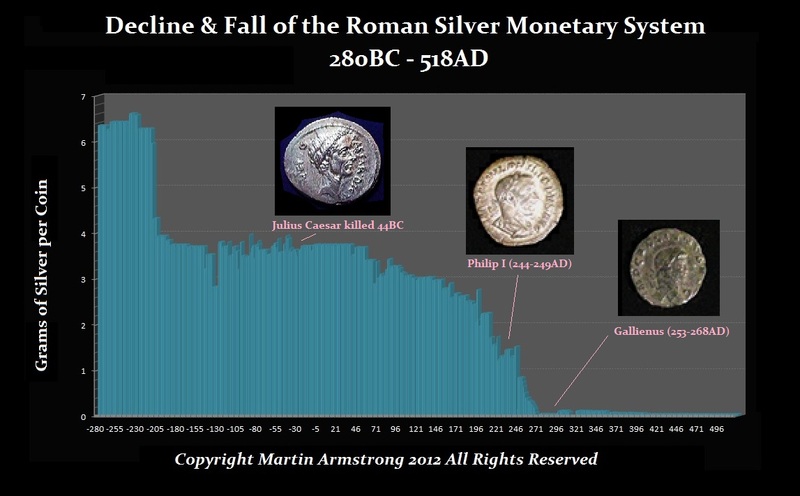 These were similar devastating economic booms and busts to the great import of precious metals from the New World by Spain that sparked massive inflation for Europe during the 16th and 17th Centuries that resulted in the bankruptcy of Spain. 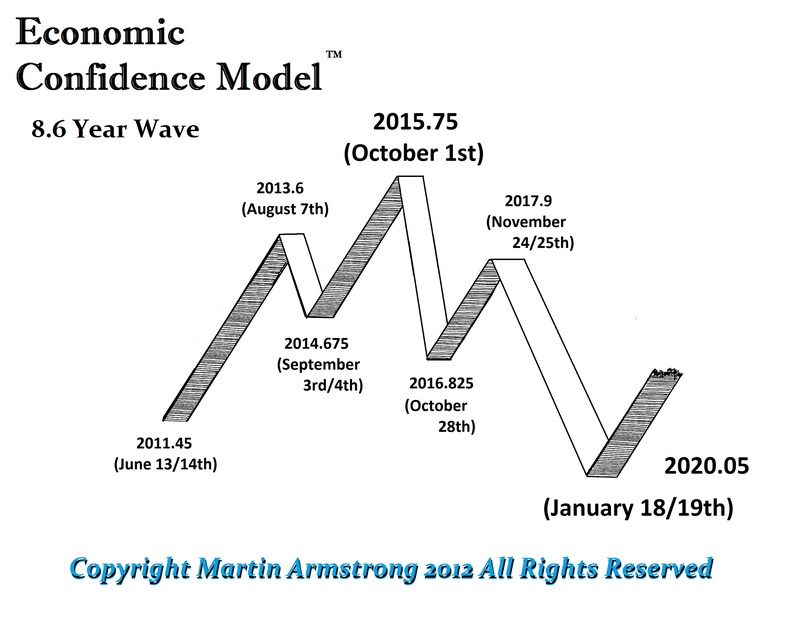 The Economic Confidence Model (ECM) is a refined theory of the Business Cycle by Martin Armstrong. 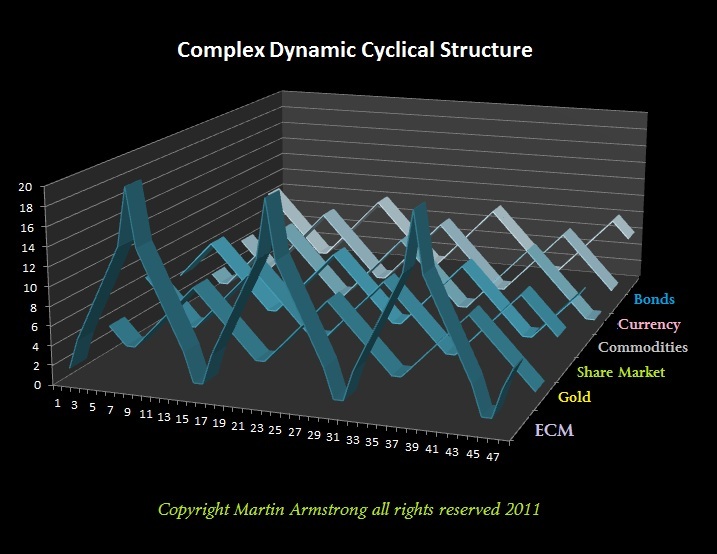 The Business Cycle has been observed by many over the centuries and the driving mechanism is indeed complex, but it certainly incorporates many aspects from the repetitive forces of nature as in the changing seasons to the human passions of man that to a large extent result in the repetitive forces driven by the passions of man. 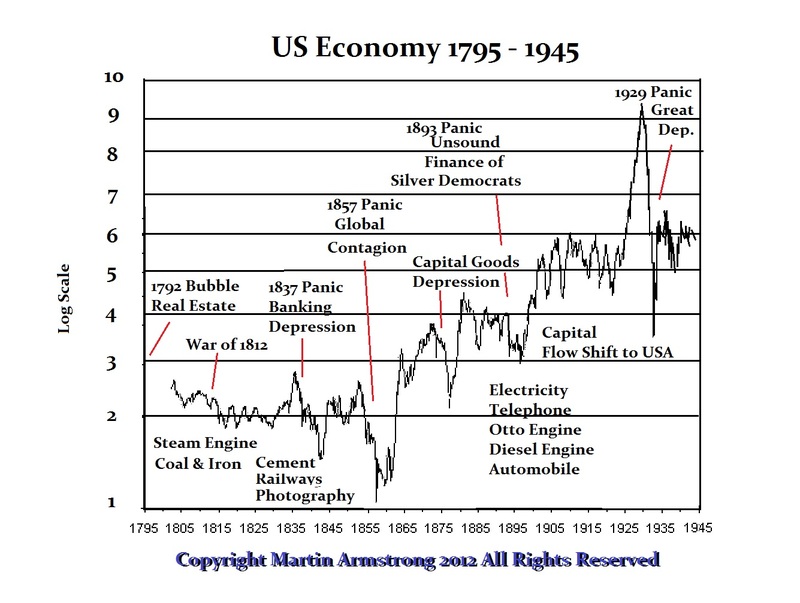 Everything is incorporated within the Business Cycle from weather to politics. Nothing moves in a straight line. Even your heart beats in a cycle. Nothing is free of a cycle as long as it lives. QUESTION: Do you think that Bitcoin will replace gold as some people claim it is some new reserve asset? Thank you for being the voice of reason in the middle of all these people p[reaching their own position. ANSWER: That is really a bizarre question. I do not see how that is possible. As far as it becoming a reserve asset that surpasses everything else, I would have to say that is not plausible. These are proposals propagated clearly by retail people involved in the conspiracy world. 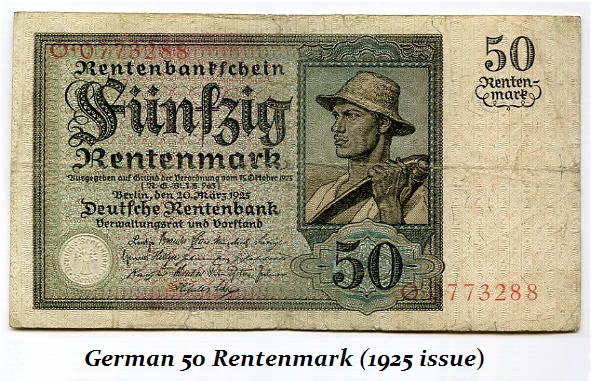 Even if we look at the German hyperinflation, the PRIMARY assets to survive was real estate. That became the backing of the replacement currency. Money itself is NEVER a store of wealth. It rises and falls against tangible assets. I have stated plenty of times that Bitcoin is a trading vehicle — nothing more. Just look at the chart. This fluctuates like everything else. That alone proves it will never be some mythical store of value or reserve assets. 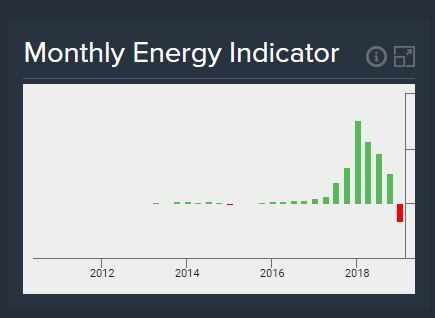 Our Energy Models have turned negative so it has squeezed out most of the excess which would allow it to make a rally if it exceeds the Weekly Bullish Reversals (see Socrates report for further details — available to subscribers only). It does not matter what you are talking about. ABSOLUTELY NO instrument will ever be the main “reserve asset” for people will always disagree. There will be people who cling to gold, others to stocks or real estate, and then we have the sublime fools who will hold government debt. You will never convince everyone to create a single reserve asset. 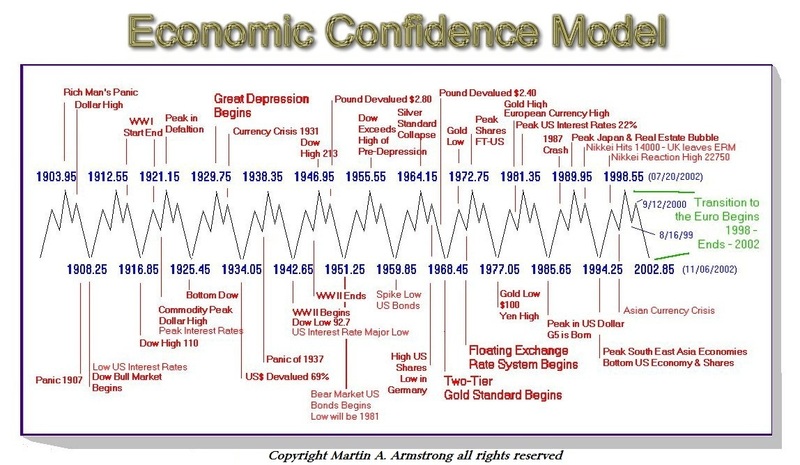 These are usually the rantings of people unfamiliar with how the world economy really functions. Even central banks hold dollars but in bonds to earn interest. They do not hold physical paper dollars. When they were leasing out gold to earn some income, these same people accused them of suppressing the market in a conspiracy. Institutions need to earn some income. This is why they do not hold gold. Gold shares they can’t hold but bullion must be lent out to earn income. How are they going to hold Bitcoin that pays no interest and fluctuates like any other commodity? What these people preach sounds great to the retail market who is just looking to make capital gains. But institutions cannot function that way. Pension funds need income to make payments. They can no more hold Bitcoin than gold bullion in a vault without income. Are Bonds Preferable to Stocks in a Crisis? QUESTION: There are a few people coming out claiming the stock market will crash so buy bonds even though you will lose money. 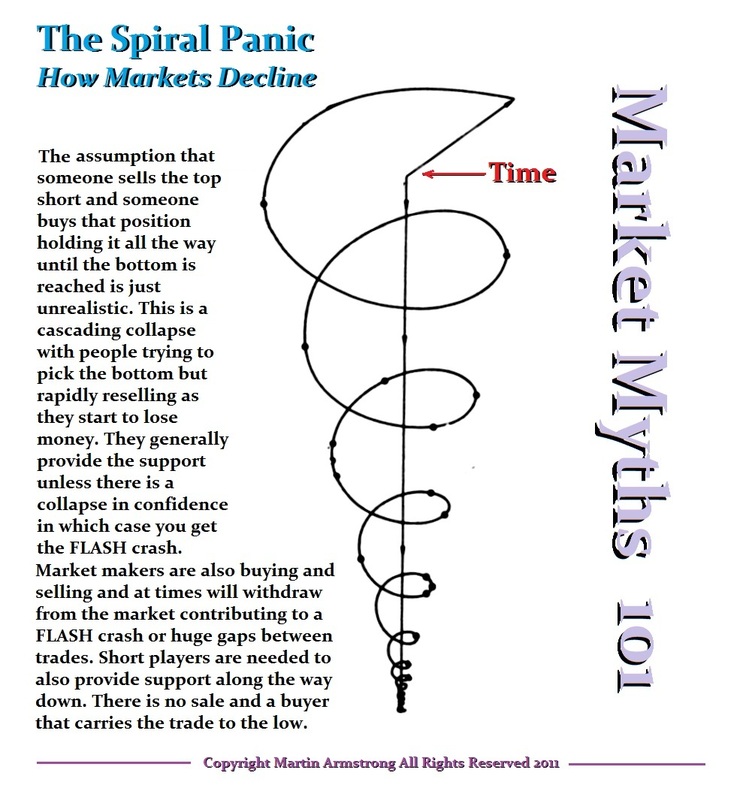 How can people keep calling for a mega-crash so long with constantly being wrong since 2010? ANSWER: These people are still living in a world that is defined by the event of the Great Depression. Even Germany forces austerity upon Europe because they do not understand the events behind their own hyperinflation and stupidly assume it was merely an increase in the supply of money that caused the event. Nobody seems to be bothered to ask which comes first – the chicken or the egg? 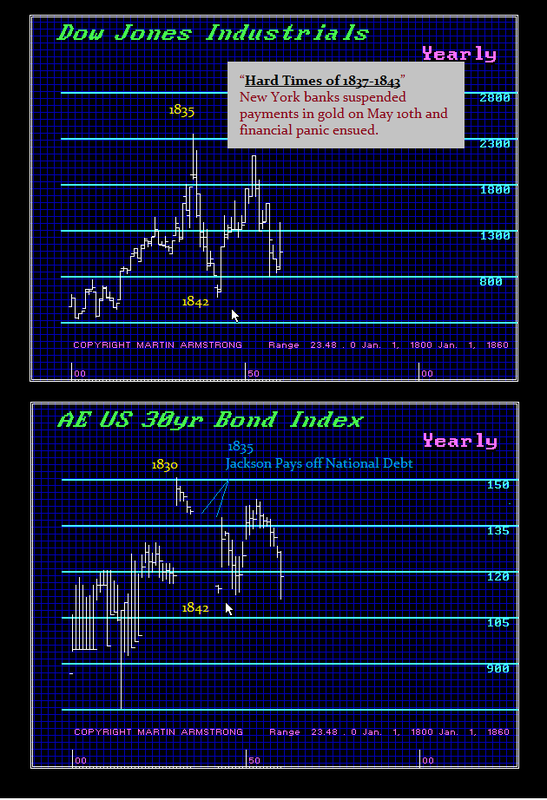 Here is a chart of the stock market with the US Long Bond. Andrew Jackson paid off the national debt in 1835. President Jackson also shut down the Second Bank of the United States on Sept. 10th, 1833. Jackson announced that the government would no longer deposit federal funds in the Second Bank of the United States, which was a quasi-governmental national bank. 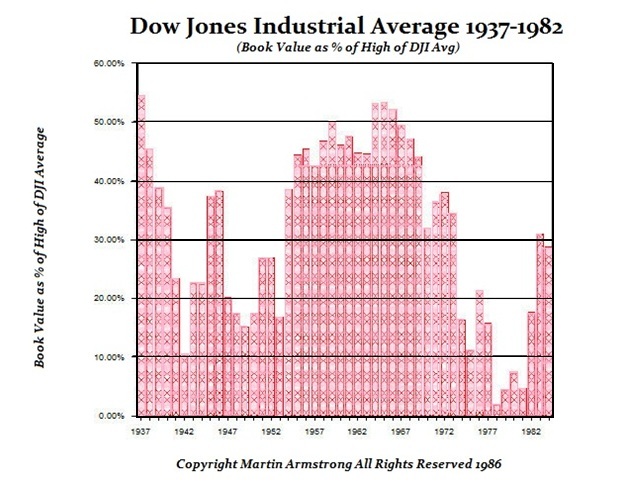 The stock market peaked in 1835 and began its decline without a central bank. Then during July 1836, Jackson issued the Specie Circular. Under this act, the government would only accept gold or silver in payment for federal land. Jackson’s Bank War closing down the Bank of the United States was personal because they funded his opposition. By shifting deposits to state banks, Jackson set off a major crisis undermining the entire monetary system. He effectively devalued all the circulating currency in the country with one law – the Specie Circular. Suddenly, there was a run on gold. The Panic of 1837 unfolds as New York banks suspended all withdrawals of gold. 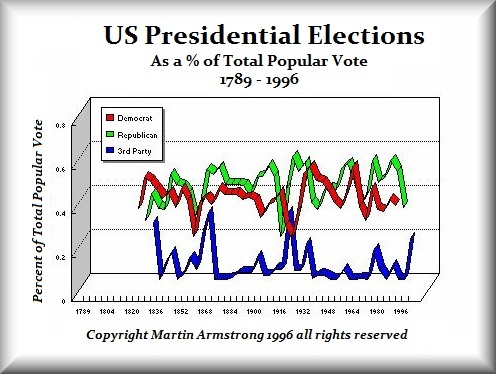 Jackson created massive austerity, but he had shut down the national debt as well. This was a very complicated financial crisis with an interesting mix of events combining together. 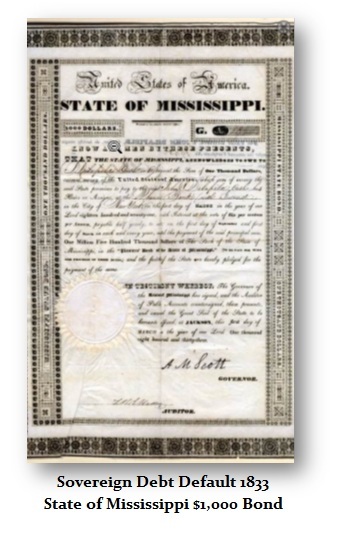 There were NO federal issues of paper money and the first paper dollar to be issued by the government did not unfold until 1860 to fund the Civil War. Therefore, Jackson effectively canceled all paper money by refusing to accept it and this resulted in a gold panic forcing the banks to suspend all payments. People were rushing to banks to exchange their paper currency for gold and banks could not meet the demand and suspended all demands for gold. When federal bonds resumed in 1842, they had declined in value as interest rates rose. 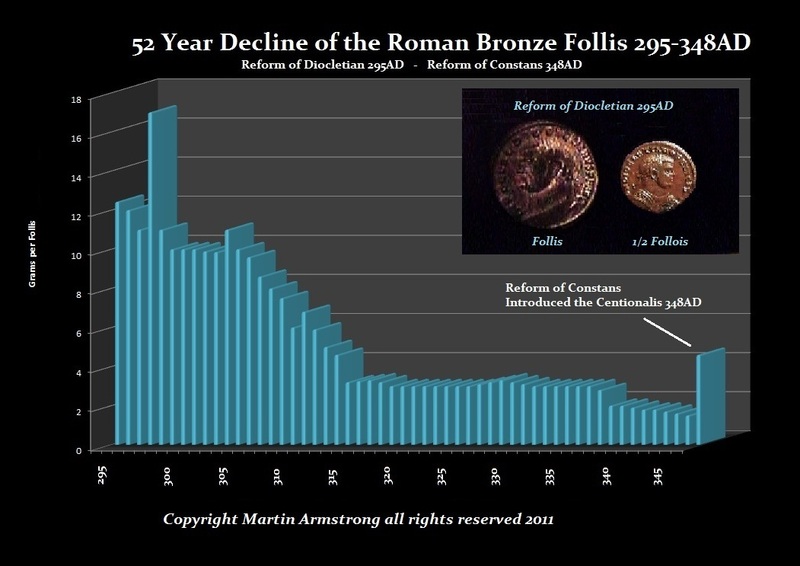 There was no flight to quality, only to gold given there were no federal bonds. This is when several states moved into default permanently upon their debt. Therefore, the Monetary Crisis Cycle that hit then was felt in the state and local levels – not federal. 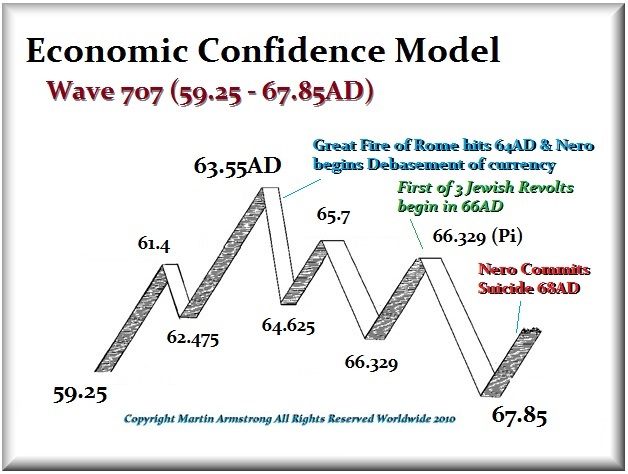 The Monetary Crisis Cycle that hit in 1931 resulted in widespread sovereign defaults outside the USA. Each cycle that hits is slightly different characters and reasons. I highly warn against buying any sovereign debt whatsoever. Any federal debt to hold must be short-term no more than 90-day paper. In the case of the Hard Times of 1837-1842, the stock market crashed in terms of gold because all money was effectively canceled. Paper money collapsed as notes lost their legal-tender value. Thus, only gold rose in value as the medium of exchange thanks to Jackson refusing to accept anything but gold. This time around, bonds are legal tender so that is the money that will decline in value far more than anyone expects. Both the Bank of Japan and the ECB in Europe have wiped out their bonds markets for they have been the primary buyer of government debt which they cannot now resell.